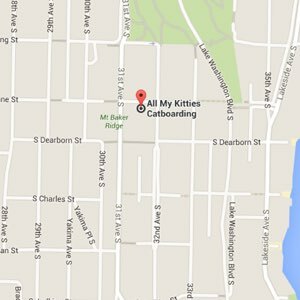 All My Kitties is a cat-only boarding facility located in Seattle’s Leschi neighborhood. We provide cats and their guardians a uniquely feline-friendly boarding experience. As the saying goes, you can’t herd cats, nor would we want to! When we began this adventure more than a decade ago, we wanted to do things a little bit differently. That’s why we designed All My Kitties with the cat’s specific needs in mind. It’s easy to think that cats are aloof or anti-social, but in fact, we find the opposite to be true. While all cats have different personalities, our feline friends enjoy companionship rather than being left alone for long periods of time. Guests at All My Kitties indulge their natural curiosity during daytime hours by exploring the cattery and outdoor Catio. And while we find cats to be social— even with other cats— they are also territorial, seeking their own “turf” when they need to retreat. Since each cat has its personally assigned condo to come and go from, they can maintain their sense of independence and feel at ease during their stay. At All My Kitties you never have to worry about your cat being cooped up in a cage all day. With space to roam, driftwood trees to climb, and birds and yard creatures to watch, Kitty gets all the stimulation and exercise he or she craves. Besides making sure your cat is comfortable, we take its health and safety very seriously. All staff undergoes a one-month training period, learning regulations set by the King County Health Department as well as our own detailed procedures. Our "cat wranglers" become more adept with each day and every guest. We feel very fortunate that they love their jobs, and tend to stay at All My Kitties for years at a time. Want to see the Cattery? 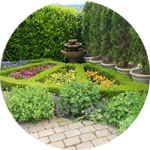 Visit our photo gallery to take a Virtual Tour. 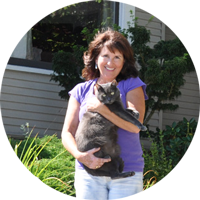 Marie Martin opened All My Kitties in 2003 - Seattle’s first cat boarding facility - when she converted the bottom story of her split-level Craftsman home into a cat sanctuary. When word got out about Marie’s “Bed and Breakfast for Cats”, she soon found herself quite busy and eventually began hiring staff to help care for her guests. Today Marie and her team are both proud and grateful that the majority of our guests are repeat customers, making All My Kitties their own “Home away from Home”. “I know I’m doing the right thing when a cat comes in for the first time and is scared and timid. Three days later they are out and about socializing, engaged, and enjoying the fresh air of my outdoor cattery. Quite a few don’t want to leave.” - Marie Martin, owner. All My Kitties supports animal organization's such as Pasado’s Safe Haven, Whisker City, Purrfect Pals, Meow Cat Rescue, and the King County Humane Society. Get all the important details about our Services and Rates.